Khaber Pakhunkhwa (KP) received heavy to moderate showers last night while scattered to light rain reported elsewhere during last 24 hours. An official of Met office told APP that heavy down pour lashed at several divisions of upper Punjab including Lahore, Sargodha, Sahiwal, Faisalabad, Rawalpindi and Gujranwal while three divisions of KP, D I Khan, Hazara, Malakand and in Kashmir at Para Chanar. in Balochistan at Zhob, Sibbi and Quetta, besides that light rain in Sindh at Mithi, Badin, Karachi and Gilgit Baltistan. which is likely to continue till Sunday with moderate to heavy rains in upper Punjab, KP and Kashmir while light to moderate rain likely in lower KP. places in Kashmir, Islamabad, upper Punjab (Sargodha, Rawalpindi, Gujranwala, Lahore divisions), upper KP (Malakand, Hazara, Peshawar, Mardan, Kohat divisions), FATA and Gilgit-Baltistan. Hot and humid weather is expected in elsewhere in the country. extending north-eastwards. Monsoon currents are also penetrating upper and central parts of the country. A westerly wave is also affecting upper parts of the country and likely to persist during 36 to 48 hours. 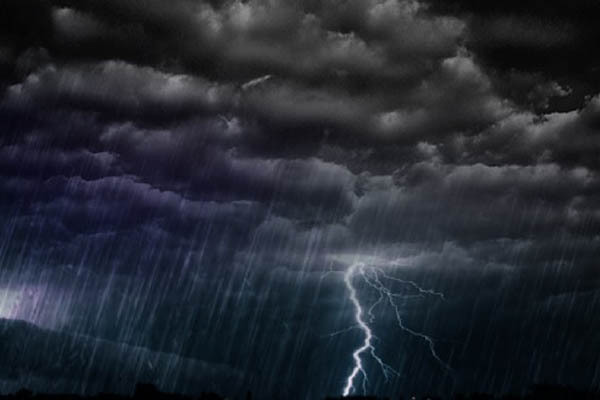 During last 24 hours rain-thunderstorm occurred at a number of places in Islamabad, upper/central Punjab while at scattered places in KP, Gilgit-Baltistan and northeast Balochistan and Hyderabad division. Bagrote 04mm, Bunji 03mm, Gupis, Gilgit, Hunza 02mm, Astore 01mm, Balochistan: Zhob 12mm, Sibbi 07mm, Barkhan 01mm, Sindh: Mithi 02mm, Badin 01mm. Maximum temperatures recorded on Monday were Dalbandin, Nokkundi 44øC, Panjgur 43øC, Dadu, Turbat, R.Y. Khan 42øC, Multan, Hyderabad 38øC, Quetta 37øC, Karachi, Faisalabad 35øC, Gilgit, Muzaffarabad, Chitral 34øC, Kalat, Lahore, Peshawar 33øC, Islamabad 32øC, Dir 30øC, Hunza 28øC, Skardu 27øC and Murree 22øC.